Ross's Law Marketing Blog: NICHE - Estate Planning. For your PET. NICHE - Estate Planning. For your PET. I used to joke in my presentations about the many law firms whose tag lines proclaimed "Representing Individuals and Businesses.TM" My thought was always, "Really? THAT's how you're focusing your practice? You won't represent PETS?!" Chicago-based Gardner Carton & Douglas (now Drinker Biddle & Reath) had a leading estate-planning practice. Here's the bird-themed luggage-tag giveaway they used to market their "Pet Trusts & Foundations" practice. In our pet-obsessed society, many wealthy people want to ensure that their beloved Polly or Poopsy will be well cared for after they die. 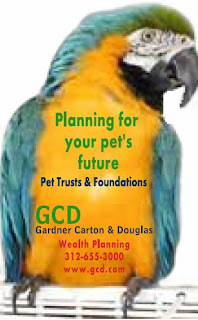 "Planning for your pet's future." Great idea. Pet Trusts are apparently a big thing. 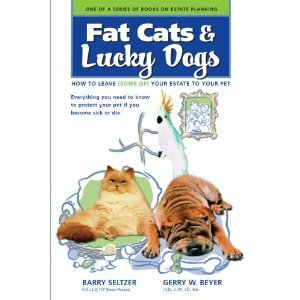 Here's a book on it as well - Fat Cats and Lucky Dogs: How to Leave (Some of) Your Estate to Your Pet. So what do YOU "specialize" in? How can you slice a piece of your practice to target a subset of something that helps you stand out above the crowd? If "pets" is already saturated nationally, perhaps you can be that practice's market leader in your city? Or market pet trusts specifically for parrots, or exotic animals? A special thanks to David Lat and Elie Mystal at Above the Law. Last week's mention of our post regarding donating unused hotel toiletries to battered women's shelters received nearly 2000 page views. There are now hundreds more people now doing just a little bit more for a group that could really use the help. Thanks, everyone. I'm just not sure how a pet can enter into a probate after his master has passed away. How is that?